For women of all types, 40 is the new 30, or perhaps even younger than that, depending on how you see things. You may be in a much better place than you were in your 20s or 30s—happier, more active and successful—with a whole different set of priorities than you had in your younger days. This is just as true for lesbians in their 40s, and if you’re looking to meet like-minded people who you can really click with, it might be time to try out online dating. Before starting, you should set healthy expectations, learn which sites may be best for you, think about your dating profile, learn what you should be looking for, and know how to proceed when you find it. The following guide will help prepare you for these challenges and more as you search for love and companionship online. We’ll just come out and say it—there are a lot of fish in this big lesbian online sea. You don’t need to be in a rush to settle down with the first person you meet online. With more and more people signing up for lesbian dating sites than ever before, you can take your time meeting and connecting with people until you find a partner who is a great match for you. When you do get out there though, be true to yourself and what you’re looking for, and don’t compromise on what you want. 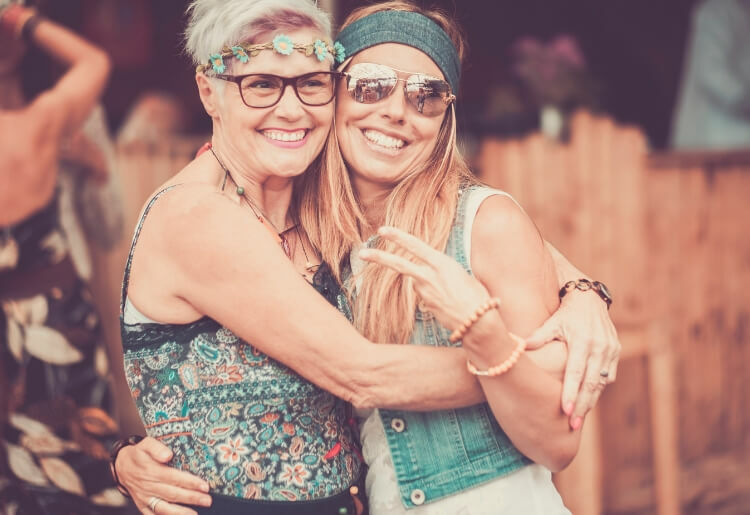 If you’re looking to meet a lesbian over 40 you can either go to a site that caters solely to lesbians in that age group, or one that connects lesbians of all ages, and then just filter for ones that are within the age range you like. Going to a larger, general lesbian dating site may increase your options and, who knows, you might find that opening up your horizons was a good decision. Whichever one you go with, you can also narrow down your prospective love interests according to your preferences. You can set up the search filter by certain physical attributes, or you can set it to find only select people who don’t smoke—or are okay with smokers—who are not religious, or those who go to church, and also filter by hobbies and/or interests. Keep in mind that these filters aren’t only a way to find what you’re looking for, but also to avoid what you are NOT looking for. It may be disappointing at times, but just like men, physical appearance is one of the first things women notice when looking at online dating profiles. Make sure to have a profile picture you’re really proud of so you’re putting your best face forward (literally), though that’s hardly the only thing. On your profile you should also briefly list some of your hobbies and interests and a few personal—though not private—details that you think would get somebody interested in seeing more. You don't want to be too open right off the bat, but should try to have some fun and be humorous and light in your profile. After all, this isn’t a doctoral thesis, it should be fun and light. First off, we all have our types and what we’re attracted to. If you look at a user’s picture and you’re just not feeling it, that might be enough to keep scrolling. If not, you can also take a look at their interests, if they like the great outdoors or they’re more of a couch potato, if they like to drink or are a teetotaler, and so on. You just might find that the person has enough in common with you and what you’re looking for that you’re willing to take a chance that maybe the lighting or the angle was just bad in that picture. Sure, worse things could be happen, but it's good to keep in mind that when trying out online dating you may just be contacted by a number of younger lesbians. For many younger lesbians, there’s just something more attractive about a woman over 40. You’re more serious, wiser and established in your life, and you know what works for you and what doesn't. There’s power in that. Online dating can be intimidating but there’s something out there for everybody, including lesbian women in their 40s who aren’t quite sure this is the thing for them. Take the time to put together the profile that you want people to see and then take that leap.